Lonsdale, Minnesota has all your lawn care and landscaping needs covered with Common Grounds Lawn and Landscape. 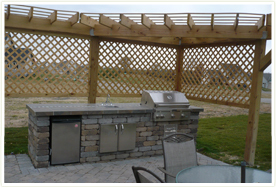 Common Grounds Lawn and Landscape is a full-service, licensed and insured outdoor company. 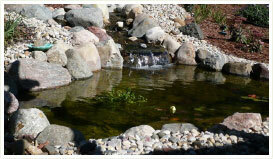 We install landscapes for new construction homes, existing homes, and also commercial properties. We are an International Concrete Pavement Institute (ICPI) certified paver installer. We are also certified applicators of fertilizing turf grass. Full Landscape Services: We offer a large variety of landscape services including: Pavers, decorative concrete, water features, retaining/boulder walls, trees & shrubs, and many more services. Hydroseeding: With hydroseeding, seed germination process starts almost immediately with seed contacting water and fertilizer right during the application process. It will also take to any type of soil and is a cheaper option that sod. It provides a longer root structure for a better source of moisture and nutrients. Site Preparation & Lot Clearing: Building a new home or property starting to get overtaken by unwanted growth? We can clear a wooded lot or mow down tall grasses and unwanted growth and get it prepared for whatever project it may be and graded to allow for hydroseeding or sod. 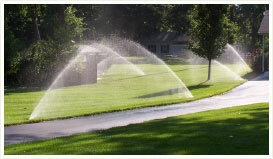 Irrigation Installation and Service: We install new irrigation systems on residential and commercial properties. We can also service any existing system and work with every brand on the market. We also have maintenance programs so your irrigation system is automatically set for the best water usage throughout the season. We also do start-ups and winterizations on all size of systems. Lawn Services: We offer full lawn maintenance service, including mowing and trimming, and mulch bed maintenance. We also do Spring and Fall clean ups, aeration, and gypsum applications to soften your soil base. Lawn Fertilization and Spraying: We offer a full schedule of turf fertilization only or weed and feed applications with different size sprayers. We are fully certified and educated to supply the right products for the right lawn. Ask us about our "green" fertilizer programs. If you are looking to have the best lawn possible, give us a call! We'll gladly provide more information on our warranties and guarantees, and also offer you a free, no-obligation estimate!